Explanation: A flying saucer from outer space crash-landed in the Utah desert yesterday after being tracked by radar and chased by helicopters and airplanes. Like last time, no space aliens were involved. 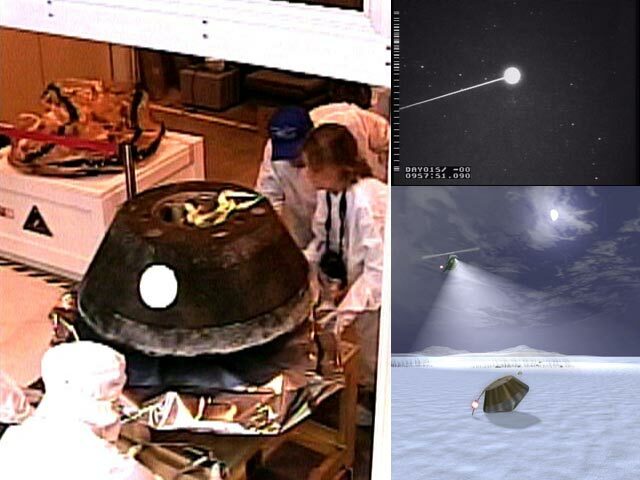 The saucer, the Stardust return capsule, is carrying bits of Comet Wild 2 captured two years ago during a rendezvous between Stardust and the ancient comet. The capsule is pictured above entering a temporary clean room in Utah before part of it is shipped to NASA's Johnson Space Center in Houston, Texas, USA. In the inset on the lower right, an artist depicts the capsule as it likely looked after it parachuted to a landing in the Utah desert. The upper right insert shows an image of the streaking capsule taken yesterday by a DC-8 chase plane. The bits of Comet Wild 2 stored in the Stardust return capsule are likely older than the Sun and will be inspected over the next few years for clues about the early years of our Solar System. You, too, can help look for dust grains in the Stardust aerogel!